Metro DC Lawn and Garden Blog: Eco-friendly gardens are "no-sweat"
Every summer at about this time, I sit back, relax with an ice-cold drink, and think about some of the added benefits of eco-friendly gardening. In many ways, eco-friendly landscapes require less work, meaning that I can have more of a “no-sweat” summer than some of my friends and neighbors with more labor-intensive landscapes. Eco-friendly gardeners work WITH Mother Nature, not against her: choosing plants that fit the site means plants are better adapted to survive with minimal care, which means Mother Nature takes care of the plants, not you. Eco-friendly gardeners plant trees with energy conservation in mind: Shade trees can significantly reduce air temperatures in and outdoors in the summer, as trees intercept and absorb the sun’s heat while transpiring cooling moisture into the air. Eco-friendly gardeners group plants by their care requirements : plants that do require extra water or fertilizer are all in one place, rather than scattered throughout the property. Eco friendly gardeners include beneficial plants: beneficial plants attract bugs and birds that help cut down on insect pest populations, eliminating the need to apply pesticides. Eco friendly gardeners have their soil tested to determine the right mix of fertilizer for their lawn rather than applying fertilizers that aren’t needed. Eco-friendly gardeners identify weeds and pests rather than spending time indiscriminately killing them all. Some bugs are good bugs. And a weed-free lawn is not necessarily a healthy one. Eco friendly gardeners replace lawn with ground covers : Most ground covers need little or no maintenance once they’re established. If they do have lawn, eco-friendly gardeners mow less oftenMowing grass to the proper height is the single-most important thing you can do to improve the health of your lawn. 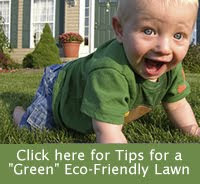 Eco-friendly gardeners don’t rake their grass clippings : Leaving grass where it falls adds nutrients back to the soil. However, be sure to sweep up your sidewalk, driveway or street so clippings don't pollute nearby lakes or streams. Eco-friendly gardeners create compost : why lug bags of trash to the curb and bags of purchased soil enhancers to your landscape? Composting your yard and kitchen scraps saves time and money. Eco-friendly gardeners water less: Plants should be watered only when they begin to droop and in the early morning hours before 10 a.m. Grasses naturally grow slower in the summer, so brown grass usually means your lawn is just dormant, not dead.